New Boston Bakery has been on our minds lately. Their name has been popping up on the search feature of our Sitemeter and in The Herald News. 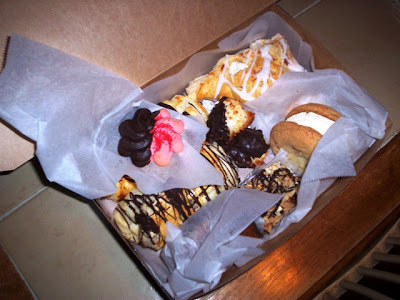 Also, due to my unemployment status, all I've wanted to do lately is drown my sorrows in a box of sugary baked goods. Last week, I visited New Boston Bakery with every attempt to do a review. However, the place was packed, all of the pastries were gone (I showed up late on a Friday - bad move), and I had no way of getting a clear photo of anything. 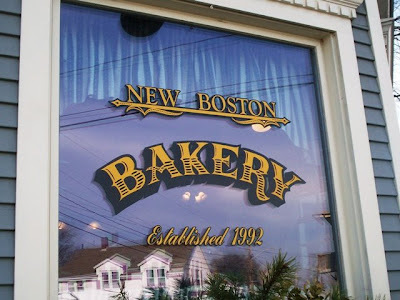 Today, I decided to spend a little of my unemployment check and take another shot at New Boston Bakery. I stepped inside at just before 2 p.m.
Let me just say this - New Boston Bakery is always busy. I have never been inside at a time when there weren't any customers both sitting at the tables and waiting in line. Today, however, there were only a few people inside and I was lucky enough to get a clear picture of one of the bakery display counters. Getting ready for the upcoming holiday, the staff had decorated the dining area with Valentine's Day decorations, and a lot of the pastries were topped with pretty pink frosting. I love when stores and restaurants get in the spirit! When I first got to the counter, I just stared at everything. I literally had no idea what I wanted. Well, I do know what I wanted - everything. A friendly woman approached me and asked me what I would like. I told her that I would get back to her in a few minutes. I was in baked good heaven! There were cookies, brownies, blondies, eclairs, cakes, squares, pinwheels, breads, bars, tarts, turnovers, and a whole section of real cream pastries. The prices ranged from less than a dollar to a little over $2 for each pastry - a little pricey, but well worth it for what you get. When I finally narrowed down what I wanted, the woman came back. 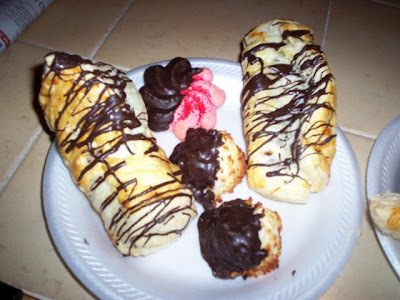 I chose two chocolate dipped macaroons, two chocolate tunnels, a cream cheese brownie, a chocolate raspberry bar, a chocolate and pink butter cookie, a real cream apple turnover, and dessert with a name that escapes me. It was a large dollop of real cream surrounded by two soft chocolate chip cookies. My total came to $10.60. Once I got home, Mom was waiting for me quite impatiently. She had been drooling for pastries just as much as I was. When I showed her everything I'd purchased, she was very pleased. She probably would have been pleased with anything, as everything that we'd ever gotten from New Boston Bakery has been outstanding. The pastries in the box. Like we envisioned, everything was perfect. All of the pastries - and all of the food items, for that matter - are made from scratch. Nothing was covered in that disgustingly sweet frosting that ruins so many cakes nowadays (i.e., Stop & Shop bakery). Nothing had an overwhelming chocolate coating that was so thick that you couldn't taste what was inside (i.e., Cold Stone Creamery). The pastry was buttery, soft, fresh, and absolutely delicious. Aside from pastries, New Boston Bakery also serves sandwiches, breakfast foods, salads, wraps, soups, and paninis. They also have a delivery service (who knew?) for local residents between the hours of 11 a.m. and 2 p.m. I used to order lunch here when I worked in the city a while back, and the food was always a big hit with everyone in the office. The prices are more expensive than what you would pay at a drive-thru, but the quality of ingredients and taste of the food is 100% better than anything you'd find at one of those places. Prices range from approximately $2.95 for a cup of soup to $7.95 for a gourmet salad. 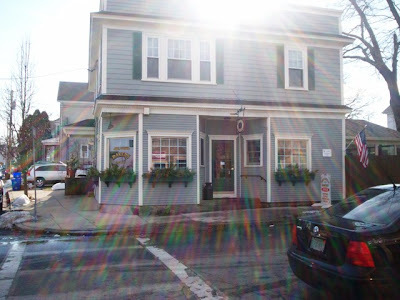 New Boston Bakery also does breakfast and lunch "platters to go." It's funny that Mom and I are always searching for outstanding bakeries in New England, forgetting that one of the best is right in our own back yard. 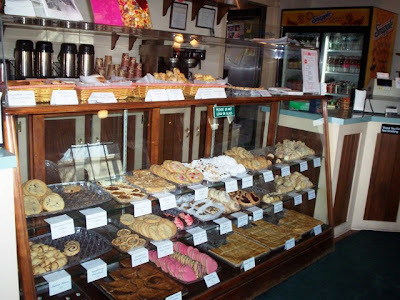 Established in 1992 and located in a historic building, this bakery is one of Fall River's hot spots. I've seen a few local celebrities standing in line with "regular Joes" waiting for their coffee and breakfast pastry. This bakery appeals to everyone! 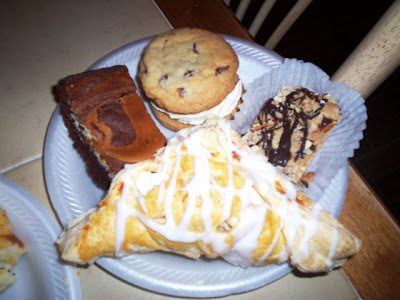 My aunt even had a party catered by New Boston Bakery, and Mom told me that everything was fresh and tasty. We can't wait to go back. New Boston Bakery is open from 7 a.m. to 5 p.m. Monday through Friday.